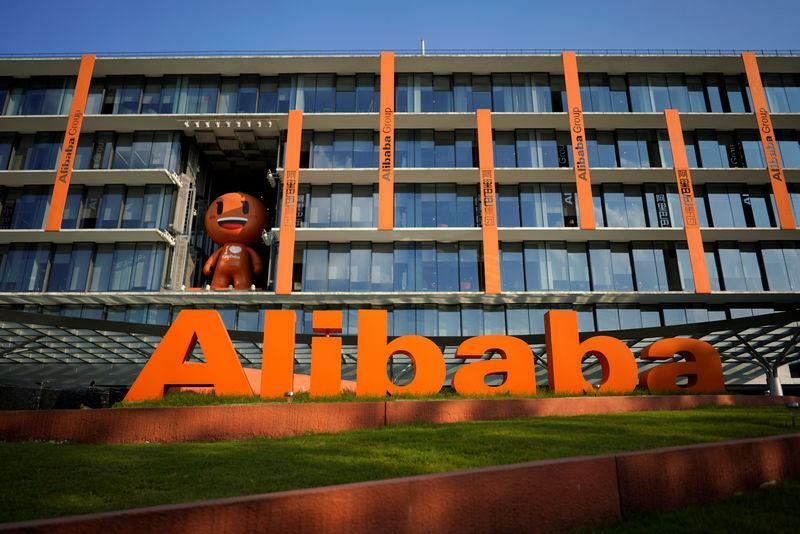 SHANGHAI (Reuters) - E-commerce giant Alibaba Group Holding Ltd's quarterly revenue grew at its weakest pace since 2016, as the impact of a slowing Chinese economy and a crippling Sino-U.S. trade war kept buyers away during its top-sale season. The result is likely to add to investor worries as it highlights the mounting pressures facing the e-commerce behemoth, whose sales are often seen as a yardstick of consumer spending in the world's second-largest economy. Alibaba, the second most valuable public company in Asia after Tencent, posted on Thursday third-quarter revenue of 117.28 billion yuan ($17.47 billion), compared with 83 billion yuan a year earlier. That compares with an estimate for revenue of 118.9 billion yuan from 31 analysts polled by Refinitiv. Net income rose 33 percent to 30.96 billion yuan, however, beating estimates and sending Alibaba's stock up by about 1.6 percent in pre-market trade. Alibaba typically posts its highest revenue in the December quarter due to its mega "Singles' Day" in November - the world's biggest online sales event that outstrips the sales of U.S. shopping holidays Black Friday and Cyber Monday combined. In 2018, even though Alibaba netted a record $30 billion from the Singles' Day, annual growth dropped to the weakest rate in the event's 10-year history as a slowing Chinese economy and trade tensions chilled sentiment. Anticipating headwinds from economic uncertainty, Alibaba had lowered its revenue outlook for its financial year ending March even before the top sales season. However, last week, Alibaba's executive vice-chairman, Joe Tsai, noted that sales had ticked up in December, although demand for big-ticket items continued to slow. Tsai also brushed aside concerns about the trade war, saying people were overly worried about its impact on China's economy. Chinese consumers are still fundamentally very strong and consumption is going to grow over the next 5-10 years, he added. "We live in an environment where external factors seem to drive investor sentiment regarding Alibaba's business," said Tsai in a call with analysts following the results on Wednesday. On the same call, chief executive Daniel Zhang said the company remains optimistic despite facing uncertainties, adding that younger buyers were driving sales. Alibaba's founder Jack Ma has previously described the China-U.S. trade spat as the "most stupid thing in the world". China's economic growth in 2018 slowed to its weakest in nearly three decades amid faltering domestic demand and bruising U.S. tariffs. Growth is expected to ease further this year. On Tuesday, China's Ministry of Industry and Information Technology (MIIT) said revenue growth rates for domestic technology companies did not rise in 2018, and that consumer spending had slowed amid increased economic pressures. Businesses worldwide are bearing the brunt of slowing growth in China growth, which has generated a third of global growth in recent years. Apple this weak said its iPhone sales slipped in the holiday shopping quarter for the first time due to weak demand in the Asian country. Given signs of saturation in China's urban market, Alibaba has been trying to grow outside of its core e-commerce business to win new customers. The company continued to invest heavily in cloud computing, artificial intelligence and online entertainment in the December quarter. Revenue from its cloud business rose 84 percent to 6.6 billion yuan, while sales from its digital entertainment and media business rose 20 percent to 6.5 billion yuan.